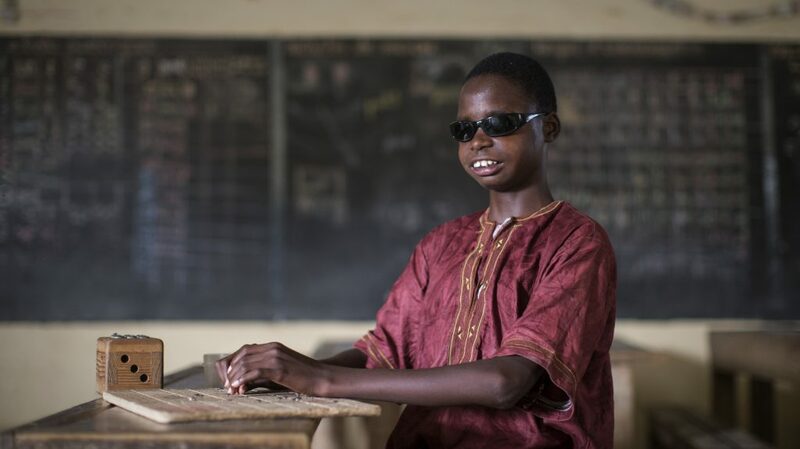 A Sightsavers-supported pilot project in Senegal has shown that children with and without disabilities can learn together in mainstream schools. Sightsavers’ inclusive education pilot project launched in three mainstream schools in Dakar in 2014. It aimed to make sure the educational needs of children with disabilities were being met, and the education systems strengthened. We worked with the General Directorate of Social Action to provide scholarships to blind students, and gave financial assistance to parents. We improved the quality of the learning environment by translating textbooks into braille and making multiple copies available. 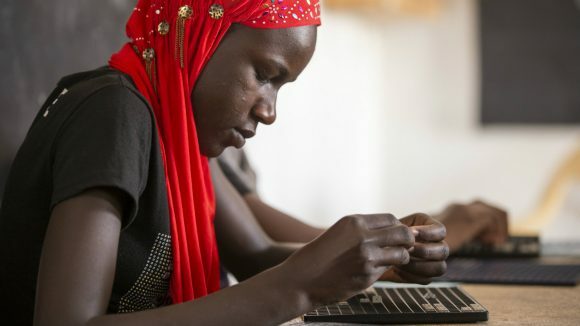 We provided teaching materials (such as braille keyboards). We adapted school facilities for the use of disabled students. 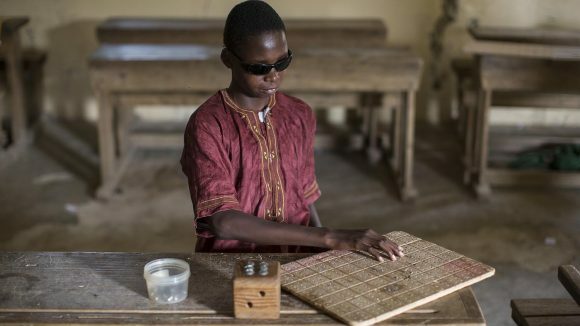 We certified children as visually impaired and provided eye care through the Senegal eye care programme, including low vision aids, braille and referrals for treatment (such as cataract surgery). We engaged parents, the media and community leaders with the programme, and shared information about how inclusive education could benefit children in the community. Training and human resources were key elements in the project. We promoted an inclusive education module for staff and supplied braille training, so teachers could learn how to support students with disabilities. We’ve shown how this approach can be replicated across the country if ministries work together, and we’ve shared our learning on inclusive education in primary schools with the government of Senegal. It wasn’t all plain sailing: at first, we found it challenging to convince parents to allow their children to attend school. Some didn’t think their children could learn, while others needed income so were sending their children out to beg. In some cases, local solutions were found to make sure families didn’t lose out. For example, one carer of two blind girls was offered a job as the school cleaner. Another challenge was the amount of extra time teachers needed to prepare inclusive classes, an issue that is likely to increase as visually impaired children learn more complex topics. Also, the quality of braille teaching materials is generally poor, and large classes (as well as huge demand for school places for visually impaired children) make it challenging to meet the needs of all the children. The children who are now attending school because of the project are achieving positive test results, and some are even outperforming their sighted peers. Sightsavers worked in partnership with Senegal’s Ministry of Education, and its staff have described us as ‘a true partner that collaborates’. We’ve persuaded the ministry to give more resources to educate children with disabilities, and to do it more strategically. Two girls. Two very different lives. Only one of them goes to school. Mbathio walks through the sandy schoolyard at break time, arm in arm with her best friend Khady. Mouhamed, aged 14, is in his first year at school. Before starting education, he would just sit at home all day.